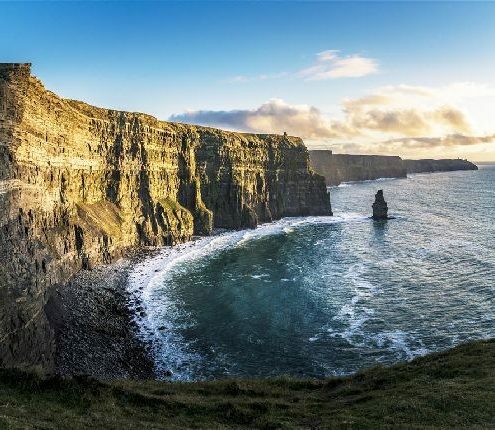 The walk takes approximately 3 hours along a gravel path and finishes at the Cliffs of Moher Visitor Centre where public transport is available for your return to Doolin. The walk is easy, always with the sound of the ocean in your ears, for approximately 8km along the coast and also crosses two sections of Pat’s farm along the way. Visitors will have the privilage of seeing the natural beauty of the area and hearing an interpretation of past and present life from the perspective of a guide who has an enthusiasm and passion for the locality. The walk starts each morning at 10am in Fisher Street outside O’Connors Pub. From the start along the road towards Doonagore Castle. 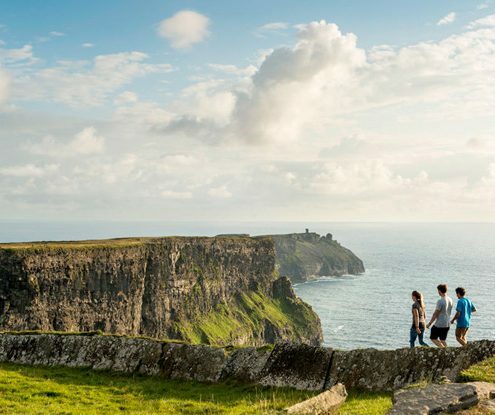 After approximately 0.5 Km you will leave the road and begin the walking trail along the Cliffs of Moher. You will see the gradual rise of the Cliffs in the distance ahead, Doonagore Castle to your left on a raised setting overlooking the bay and, depending on the weather the waves of the Atlantic crashing below at the base of the Cliffs. You will walk along until you reach the highest point of the Cliffs of Moher standing 214m (702 feet) above sea level, where views of the Dingle Peninsula and Loop Head in the South, the Aran Islands to the West with the Twelve Pins and mountains of Connemara to the North can be seen on a clear day. O’Briens Tower is near the highest point and serves as an excellent viewing platform, as has been the case for hundreds of years. We regret that the walk is not considered suitable for children under the age of eight. In deference to wildlife and landowners, all dogs must be on a leash. Walkers are asked to adhere to the “Country Code” and “Leave no trace” of their visit. In the event of severe weather difficulties, the walk may need to be postponed or cancelled.